Aphrica on Schöner’s 1520 globe, Germanisches Nationalmuseum Nuremberg. Photo by Monika Runge. In the fifteenth and sixteenth centuries the Portuguese and Spanish were at the forefront of European maritime explorations. Trying to circumvent hostile Muslim and Italian middlemen in the Mediterranean, North Africa, and the Middle East, they sought direct access to lucrative West African and Indian Ocean trading networks. As traders travelled ever farther away from home and encountered entirely new lands and peoples, it became apparent that the old conventions [LINK to T-O map] of charting the earth were insufficient. Rather than maps that primarily served theological purposes, the most modern maps aimed at providing accurate spatial representations, highlighting relative distances, locations, and notable physical features to facilitate maritime travel. 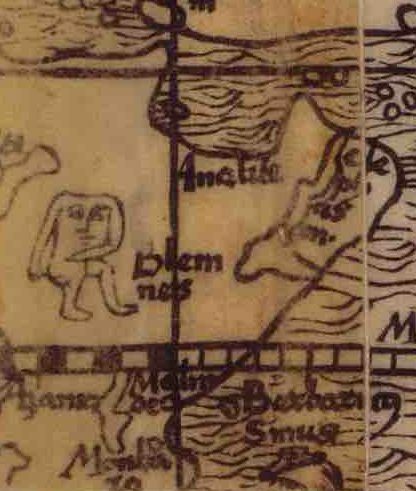 Drawing from classical sources like Ptolemy as well as the most contemporary travel reports, mapmakers also hoped to provide the most up-to-date, “scientific” information on the sorts of peoples and creatures one might encounter. Mapmakers were thus at the forefront of processing and disseminating knowledge about the wider world for Christian Europe, and we can see in their work the dramatic expansion of European knowledge, the continuing relevance of fantastical legends, and a persistent presumption that Christian Europe represented the height of civilization. The Blemmyae of east Africa, detail from a version of Schöner’s 1515 globe, Library of Congress, Washington D.C.
Johann Schöner was a scholar based in Nuremberg, and his 1515 globe is one of the oldest still in existence. The image above, however, comes from a 1520 edition, which he produced for the Bamberg notable Johannes Seiler. Like other contemporary maps, Schöner’s globes and the supplementary work he produced are remarkable for the details that they provide about the coast and interior of Africa, which European travellers were only just coming into contact with. His globe shows a curious mixture of fact and fantasy as contemporaries struggled to reconcile longstanding myths and presumptions with objective analysis of their extraordinary encounters. He gives more or less accurate details of the locations of rivers and major trading centers along the coast, and he also notes the presence of wondrous creatures like elephants, giraffes, dragons and basilisks. For his details on the interior of Africa Schöner drew mainly from classical sources, and so this was a land populated by various dark-skinned peoples identified by classical authors as well as the Blemmyae, monsters with their heads in the middle of their chests. 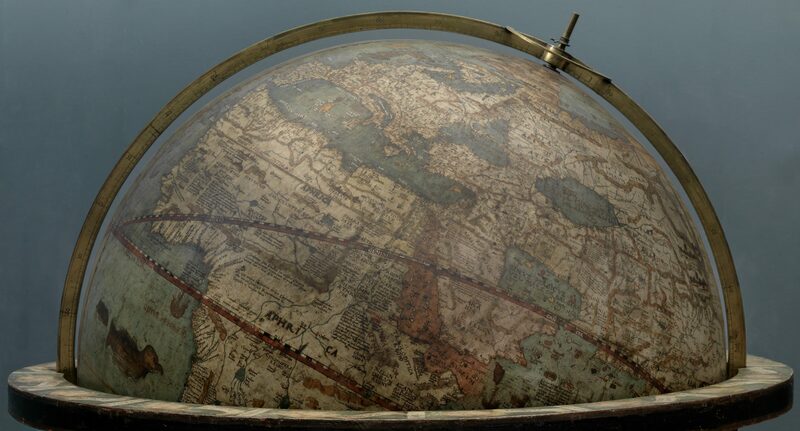 In this globe Schöner located Prester John in India, although the 1515 version claims that he had come from India to Abyssinia, illustrating the confusion over where Europeans should go to find the legendary Christian king. As the scholar Chet van Duzer has noted, Schöner’s attention to the Three Kings is also noteworthy. Although a number of contemporaries had shown the Kings together, few had tried to identify their homelands. In the supplementary work to his 1515 globe Schöner shows himself to have been influenced by the developing trend of including a Black Magus in the Adoration, although he disagrees with the details presented in John of Hildesheim’s legend. He locates Melchior’s Tharsis in northern Asia, places Caspar in Arabia, and identifies Ethiopia sub Egypto (near Sheba/Saba) as Balthazar’s homeland. Source: Johannes Schöner, Fragmentary terrestrial globe gores, ( Saint Dié, France: publisher not known, 1517), Library of Congress, Washington, D.C. 2016586441; Johannes Schöner, Erdglobus (1520), Germanisches Nationalmuseum WI1, photo by Monika Runge. ©Monika Runge. Johann Schöner’s globes (1515, 1520) by Jeff Bowersox is licensed under a Creative Commons Attribution-ShareAlike 4.0 International License.